"STOP GENOCIDE AND VIOLENCE IN IRAQ AND SYRIA"
MY CRITICISM AND COMMENTS AND SUGGESTIONS AND VOICE ON THE WORLD ISSUE ABOUT ATROCITIES, HUMAN RIGHTS VIOLATIONS AND GENOCIDES IN INSURGENCY IN IRAQ AND SYRIA. THE CRITICS CONDEMN AND AGAINST EVILNESS WITH FAITH TO GOD THRU JESUS CHRIST AND WE KEEP OUR FAITH TO GOD THRU JESUS CHRIST AND HELP OF MOTHER MARY MIRACLES AND LIGHTS TO PROTECT CHRISTIANS AND ALL THE PEOPLE AND GOOD FROM EVILNESS AND HUMAN RIGHTS VIOLATIONS AND WAR ATROCITIES. THE BIBLE WORDS OF GOD THRU JESUS CHRIST THE WAR AND FAMINE AND HARDLIFE AND PERSECUTIONS WILL COME IN THE FUTURE BUT IT IS NOT THE END IT IS THE START OF HARD LIFE AND TRIBULATIONS AND JUDGMENT DAY, READ THE EXACT VERSES IN MARK 13:3-23 BIBLE NEW TESTAMENT. TO ALL THE PEOPLE SPECIALLY SYRIAN AND IRAQUIS KEEP FAITH TO JESUS CHRIST TO BE SAVE FROM ATROCITIES, DEATH AND VIOLENCE IN WAR AND ANY DANGERS AND SURVIVE THE HARDLIFE AND FAMINES AND PERSECUTIONS AND LEAD YOU TO PEACEFUL LIFE UP TO JUDGMENT DAY. IN OUR TIME IF YET THE JUDGMENT DAY IS NOT THE TIME THERE IS PEOPLE AND GOVERNMENT WILL SEND BY GOD TO SAVE US FROM THIS WAR AND ANY HARDLIFE AND JUST KEEP FAITH TO GOD THRU JESUS CHRIST UNTIL JESUS CHRIST WILL SAVE US ALL IN JUDGMENT DAY. THE INSURGENCY INTERNAL CONFLICTS AND WAR IN IRAQ AND SYRIA AND OTHER COUNTRIES EVEN IN THE PHILIPPINES ARE PROPHESY OF JESUS CHRIST THAT WAR AND FAMINE WILL RISE IN THE FUTURE BUT THIS IS NOT THE END OF TIME. 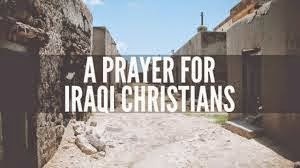 THE INSURGENCY AND WAR NOW IN IRAQ AND SYRIA ARE PRACTICING GENOCIDES AND SEVERE HUMAN RIGHTS VIOLATIONS KILLING MINORITIES LIKE CATHOLIC BELIEVERS AND OTHER MINORITIES AND GENERALLY INNOCENT PEOPLE OR NON COMBATANT SUFFERING ATROCITIES. THE WAR IN IRAQ AND SYRIA WERE ESTABLISHED BY ISIS OR ISLAMIC STATE OF IRAQ AND SYRIA PRACTICING VIOLENT APPROACH IN PERFORMING THEIR STRUGGLES WITH RELIGIOUS ATTACHMENTS AS JIHADIST OR EXTREME MUSLIM BELIEVERS. IN THEIR BELIEF AND PRINCIPLE IF A PERSON ARE NON BELIEVERS THEY MUST BE KILLED AND IT IS NOT FAIR FOR COMMON GOOD AND HUMAN RIGHTS ABIDANCE IN EVERY COUNTRY TO WHOLE WORLD AND IT IS A THREATS AND VIOLENT ACTS AND TERRORISM. IT IS ALSO NOT GODLY BECAUSE GOD TAUGHT US TO HAVE FREEDOM OF CHOICE AND RESPECT LIFE AND THEY ARE DISRESPECTING IT. IN BIBLE AND QUORAN GOD TAUGHT US TO HAVE FREEDOM OF CHOICE. IN GODS RULE IN HIS JUDGEMENT DAY OR JUDGEMENT IF A PERSON IS NOT A BELIEVERS OR BELIEVE IN GOD HE WILL DIE BUT IN THIS TIME IN EVERY COUNTRY JIHADIST AND THEIR WORLD PERSPECTIVE THEY MUST RESPECT HUMAN RIGHTS AND NOT EMPLOY GENOCIDES SPECIALLY TO INNOCENTS AND NON COMBATANTS, RESPECT FREEDOM OF CHOICE AND INNOCENT LIVES. 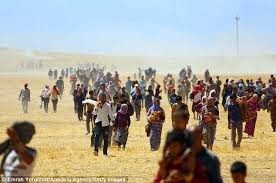 THE GENOCIDES EMPLOYMENT OF FORCE BY ISIS IS AN ACT OF EVIL AT NOT AN ACT OF GOD AND EVEN HOW THE WORLD EXPERIENCED THEY HAD HAVING NO COUNTRY OR OPPRESSIONS IN LIFE AND DISRESPECTING LIFE OF OTHERS IS NOT RIGHT AND EQUAL. ANY PEOPLE DISRESPECT GOD THEY MUST DIE BUT IT WILL HAPPEN ONLY IN JUDGMENT DAY OR IN LIKE NOAH AND OTHER JUDGMENT TIME GODS DID DURING THAT TIME AND NO PERSON EVEN GOVERNMENT OF THE PEOPLE CREATED BY GOD TO US SHALL IMPOSE THIS IN THE PROCESS OF LIVING IN THIS WORLD BUT ONLY GOD WHICH GOD GIVE US ALL RIGHTS TO CHOOSE WETHER GOOD OR BAD OR TO BELIEVE OR NOT AND THE JUDGMENT TIME HE GAVE IN JESUS CHRIST GOSPEL IS THE FINAL TIME FOR ALL TO DECIDE HIS FAITH TO GOD. IN COMMON GOOD THE ISLAMIST JIHADIST BELIEVERS SHOULD RESPECT HUMAN RIGHTS OF EVERY PERSON NOT JUST TO KILL FOR THE SAKE OF RELIGIOUS BELIEF AND GOD DOES NOT TEACH US TO KILL BUT TO RESPECT LIFE AND OUR FREEDOM TO CHOOSE. THE JIHADIST METHOD IN THEIR STRUGGLE EMPLOYING UNRATIONAL AND UNEQUAL AND EXTREME KILLING A PERSON MAKING GENOCIDES OR MASS KILLINGS IS NOT RIGHT AND IT IS TERRORISM AND THREATS TO A NATIONS OR COUNTRY AND WHOLE WORLD. THE JIHADIST HAS TO RESPECT RIGHTS AND FREEDOM TO CHOOSE AND THE ENCOURAGEMENT OF RELIGIOUS BELIEF WITH ARMED STRUGGLE SHOULD NOT DISRESPECT HUMAN RIGHTS AND OTHER RELIGIOUS BELIEF. RESPECTING THE MUSLIM JIHAD RIGHTS AS PERSON THEY HAS RIGHTS BUT WHAT EVER THEIR STRUGGLES IN LIFE IS, STRUGGLES IT ABIDING HUMAN RIGHTS AND RESPECTING FREEDOM TO CHOOSE. THE BEST OF ALL THE JIHADIST SHOULD ENTER IN PEACE ON WHAT STRUGGLES YOU HAVE IN LIFE TO ACHIEVED IT NOT IN ATROCITIES AND VIOLENT ACTS. AGAIN TO JIHADIST ABIDE HUMAN RIGHTS AND RESPECT LIFE IN YOUR STRUGGLES DO NOT EMPLOY GENOCIDES OR HUMAN RIGHTS VIOLATIONS ONLY GOD SHALL DESTROY NON BELIEVERS IN JUDGMENT DAY AND NOT IN THIS TIME TO RULE FOR HIS KINGDOM. HIS KINGDOM TODAY SHALL REIGN IN CHURCH IN FAITH FOR GOOD SUPREME ORDER UNDER GOD RULES AND THE GOVERNMENT AND WORLD ORDER OR COMMON GOOD SHALL ONLY BE GUIDE BY SUPREME GOOD OF GOD OR GOD TEACHINGS NOT TO EXTREMELY ENFORCE TODAY AS ONE SIDED RULE UNDER ONE RELIGION WHICH EVERYONE HAS FREEDOM OF CHOICE. IT IS GOOD THE WORLD IS UNDER THE GODS RULE OR KINGDOM TO GOVERN IN THE WORLD ORDER BUT THE RIGHTS OF EVERYONE SHOULD BE GIVEN TO CHOOSE WHAT RELIGION OR BELIEF A PERSON OR GROUP OR COUNTRY LIKES. IN ENCOURAGING RELIGIONS TO RULE IN THIS WORLD IT MUST BE IN PEACE NOT IN FORCE. RELIGION OR GODS TEACHINGS IS THE SUPREME GUIDANCE IN COMMON GOOD OR GOVERNMENT IMPLEMENTATIONS FOR GOOD OF ALL RESPECTING GOD OR BEING UNDER GODS KINGDOM. IF THE GOVERNMENT ARE COMMITTING ABUSES AND OPPRESSION'S AND GRAVE HUMAN RIGHTS VIOLATIONS I BELIEVE IN LIBERATION THEOLOGY OR RADICAL AND ACTIVISM IN CORRECTING GOVERNMENTS EVIL DOING LIKE THE CORRUPTIONS IN THE PHILIPPINES AND ABUSES AND THE BIBLE TEACHING COULD CORRECT THEM IN RADICAL WAY OR ACTIVISM WAY NOT JUST TYPICAL AND SIMPLY ADVISING GOVERNMENT TO DO GOOD OR TEACH THEM IN CHURCH AND IN PROMOTIONS TO TO GOOD AND SHARE WORDS OF GOD TO THEM OR UNITE PEOPLE IN GODS WORDS TO DO GOOD. MOTHER MARY LIGHTS AND MIRACLES BLESS US THE MIRACLES AND LIGHTS OF PEACE TO WHOLE WORLD SPECIALLY TO SYRIA AND IRAQ AND OTHER COUNTRY UNDER INSURGENCY AND WAR.